We're spending like there's no tomorrow in 10 minutes of the latest NIS title to hit the west. 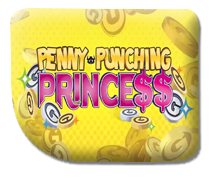 Todays Dive In is a 10 minute look at Penny Punching Princess from Nippon Ichi Software (NIS America). Released in the EU on the 30th March for £39.99, with the US copy to follow the week after. A top down dungeon crawler with a wacky storyline centered around a kingdom reliance on money that oozes with NIS' unique brand of humour.